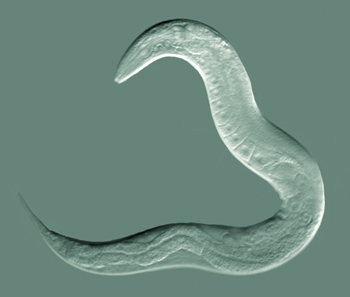 Nematode worms live longer if their grandparents had particular genes. But they don’t need to receive the genes themselves to feel the effects. What’s the News: Scientists have discovered that worms who’ve been given mutated genes that let them live longer pass on their longevity to their descendants—even when the descendants don’t receive the genes. How does it work? The team had previously found that disabling a set of three proteins, called the H3K4me3 complex, would cause worms to live longer—usually for about 27 days rather than 20 days, an increase of 35%. This complex manages the packing of DNA, which is important in the expression of genes. (If DNA is loosely packed, it’s easy for the cell’s machinery to read it and make the proteins the genetic code specifies. But if DNA is tightly packed, it won’t be read out.) When the complex is disabled, some genes are trapped in the tightly packed state. The team thinks that genes related to aging are among those taken out of commission. When worms carrying a malfunctioning complex bred with normal worms, their descendants had the normal, functioning DNA-packing proteins, yet somehow lived as long as their long-lived parents. The trend continued for three generations before petering out. Looking closer, the team found a possible reason for why long life continued. The changes that complex makes to the packing of DNA are usually reset with each generation, but for some reason, they hadn’t been wiped in the descendants—possibly because the protein that performs that service was itself trapped. These alterations in DNA packing that get passed down fall under the heading of epigenetics—heritable changes that occur not because of actual changes in the DNA, but because of some other factor that changes how genes are expressed. This isn’t the first time biologists have found that parents can pass on epigenetically altered traits to their offspring—others include fur color in mice and flower symmetry in plants—but this is the first time they’ve seen it for a complex trait like longevity. The fact that the change peters out after a few generations leads researchers to question whether such a trait would come into play in natural selection, long term. But one could imagine that certain traits, even if short-lived, would be very useful in dealing with stressors likely to span several generations, like drought and famine. Could this kind of effect on longevity occur in humans? We do have that same complex; it’s possible that defects in it could be related to longevity in us as well. As to whether the epigenetic changes in your grandparents can affect you, that’s a question ripe for future research. But here’s some food for thought: We already know that a pregnant woman’s environment can affect her children’s epigenetic traits—read up on the Dutch Hunger Winter study here.